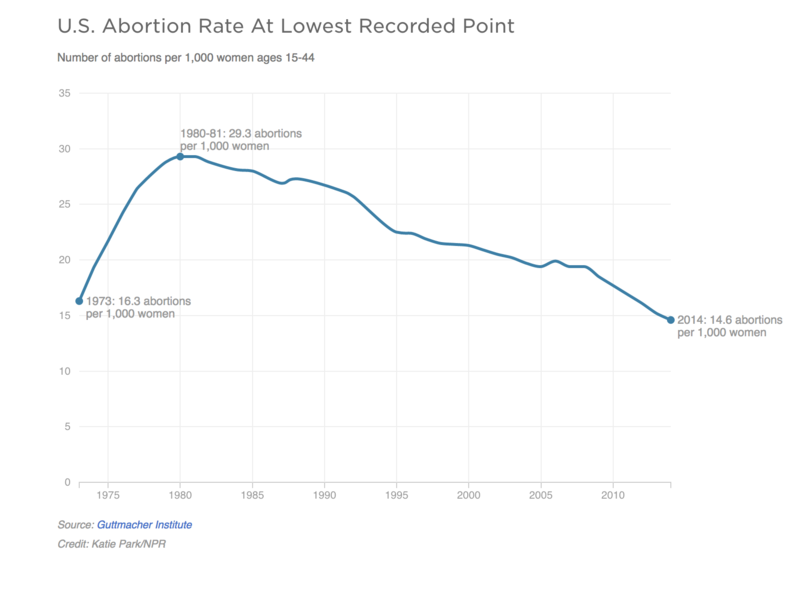 The U.S. abortion rate is at the lowest recorded point since the Supreme Court's Roe v. Wade decision in 1973. The report also finds that in 2013, the total number of abortions nationwide fell below 1 million for the first time since the mid-1970s. In 2014 — the most recent year with data available — the number fell a bit more, to 926,200. The overall number had peaked at more than 1.6 million abortions in 1990, according to Guttmacher. Perhaps not surprisingly, given the longstanding controversy around abortion policy, the meaning of the report is somewhat in dispute. Planned Parenthood President Cecile Richards said efforts to help women get better access to contraception are paying off. She points in particular to recent improvements in the rate of unintended pregnancies, and a historically low teen pregnancy rate. "It shows that we're finally doing a better job of helping women get access to birth control that's affordable and that's high-quality," Richards said. As President-elect Donald Trump prepares to take office, Richards is gearing up for a fight over federal funding for women's health services provided by Planned Parenthood. Republican leaders in Congress have vowed to work with Trump to repeal the Affordable Care Act, which requires contraceptive coverage for many women. "We shouldn't go backwards on access to birth control," Richards said. Some anti-abortion groups, meanwhile, argue the Guttmacher report shows new state restrictions on abortion are working. Kristi Hamrick, a spokeswoman for Americans United for Life, said she has her doubts about the Guttmacher report — since the data come from surveys of abortion providers — but accepts the overall conclusion. She emphasized the impact of new regulations on clinics and laws requiring women seeking abortions to get an ultrasound, which she said are having a "real, measurable impact on abortion." "These have been game-changers, and we see the abortion rate dropping in response," Hamrick said. Hamrick said she believes abortion numbers are also falling in part because public sentiment is turning against abortion — although surveys by the Pew Research Center show opinions on abortion have been largely stable over the past two decades. The Gallup polling firm has found Americans largely divided on abortion in recent decades, with a majority labeling themselves "pro-choice" in a 2015 survey. The Guttmacher report says abortion restrictions do appear to be a factor in the declining numbers in some states. But principal research scientist Rachel Jones, lead author of the report, said that's not the whole story. She noted that abortion declined in almost every state, and "having fewer clinics didn't always translate into having fewer abortions." "Abortion is going down, and births aren't going up," Jones said. Chuck Donovan, president of the anti-abortion Charlotte Lozier Institute, called the drop in the abortion rate "good news," regardless of one's political point of view. He said there are likely a number of factors behind the decline. "By and large, this is encouraging for a country that obviously remains deeply divided and discomfited about the benefits of abortion to the public," Donovan said. But when it comes to abortion, common ground is hard to find. The Guttmacher Institute's Jones said the data may signal that some women who want abortions can't get access. "If there are women in these highly restrictive states who want abortions but can't get them because there aren't any clinics that they can get to, and that's why abortion's going down, that's not a good thing," Jones said. "But we think the story that's going on in a lot of situations, in a lot of states, is that fewer women are having unintended pregnancies and in turn fewer abortions, and that is actually a good story." More than four decades after Roe v. Wade, abortion remains a major political issue. But the number of American women seeking abortions has steadily declined. A report out today shows the abortion rate recently fell to its lowest level since the landmark Supreme Court decision. NPR's Sarah McCammon has more. SARAH MCCAMMON, BYLINE: The abortion rate hit its peak in the early 1980s at more than 29 abortions per 1,000 women of childbearing age. In recent years, the rate has fallen to around half that. That's according to new data for 2014 released by the Guttmacher Institute, a research group that supports legalized abortion. It's the lowest level since 1973, the year abortion became legal nationwide. Lead author Rachel Jones is a research scientist with Guttmacher. RACHEL JONES: There is some evidence that, at least in some states, decreased access to abortion is contributing to the decline in abortion. MCCAMMON: Some states like Texas that have enacted new abortion restrictions have seen clinics close in recent years. Jones says their report found fewer clinics didn't always translate to fewer abortions, though. For example, the number of clinics went up in the Northeast. But the abortion rate in the region still went down. JONES: So if you have abortion declining in states that aren't restrictive, this suggests that there's something else going on. MCCAMMON: That something, she says, appears to be better access to contraception. For more than a decade, Jones notes, growing numbers of women have been using long-acting birth control options like IUDs, which are highly effective and last for years. The dropping abortion rate is drawing praise from both sides of the abortion debate, although for different reasons. Planned Parenthood president Cecile Richards says it shows the importance of giving women access to better contraception. CECILE RICHARDS: There's just no way to overstate the difference that this has made in this country. And unlike other public health issues, where we're really not sure how to solve them, this is a problem that - we know the solution collectively. MCCAMMON: As President-elect Donald Trump prepares to take office, and Republicans in Congress vow to repeal the Affordable Care Act, Richards and other abortion-rights advocates are gearing up for fights over reproductive health policy. Republicans have promised to make cutting federal funding for services provided by Planned Parenthood a top priority. For Chuck Donovan, President of the anti-abortion Charlotte Lozier Institute, a trend toward fewer abortions is good news. CHUCK DONOVAN: By and large, this is encouraging for a country that, obviously, remains deeply discomfited and divided about the benefits of abortion to the public. MCCAMMON: Anti-abortion advocates tend to de-emphasize contraception as a driver of the declining rate. Donovan thinks people's attitudes are turning against abortion. That's despite research by the Pew Center suggesting public opinion on the issue is largely stable. Rachel Jones with Guttmacher says it's not just that fewer women are choosing abortion. JONES: Abortion is going down, and births aren't going up. And what we're seeing are fewer women getting pregnant in the first place. MCCAMMON: Meanwhile, the Guttmacher report also found that, in 2013, the total number of abortions nationwide fell below 1 million for the first time since 1974, a decline that continued the following year. Sarah McCammon, NPR News. Transcript provided by NPR, Copyright NPR.